It was with eager anticipation of some serious riding that I eased open the throttle past Southampton, gearing up for an exploration of a previously (for this rider at least) undiscovered isle. 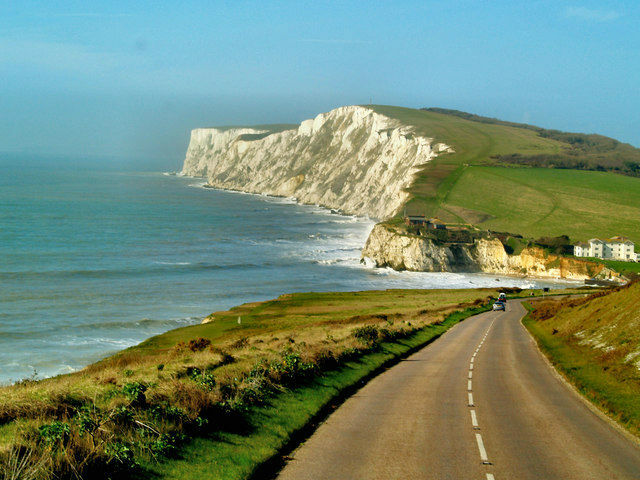 A long weekend’s biking holiday was beginning and the Isle of Wight was the elected destination. 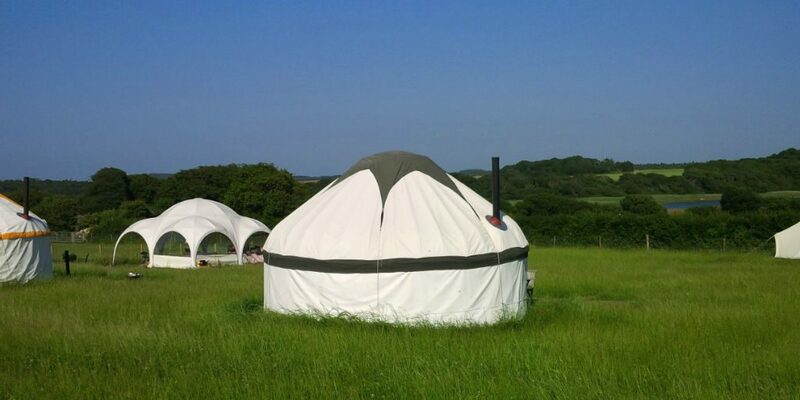 I was to experience glamping for the first time and The Really Green Holiday Company seemed the perfect choice, offering high quality environmentally-friendly camping holidays in fully-furnished canvas yurts. The traffic on the approach to the New Forest became slower and slower, until finally grinding to a near standstill. I could see the beads of perspiration forming on the furrowed brows of drivers who, like myself, had a ticket in their pocket for the 12.15 ferry from Lymington. No such concern for yours truly, however, as I glided at a doubtlessly infuriating pace along the inside of these lines of melting traffic. Great was my relief to finally exit that passageway of woe and even greater my delight to find myself in the New Forest – an area full of great routes – but for now my focus was on reaching Lymington before the ferry weighed anchor and chugged away from port. In typical fashion, I had left myself quite enough time but no great margin for error, and the dashboard clock was telling me that a flick of the right wrist was well in order. With just minutes to spare we reached Lymington and wiggled through to the ferry port to see the vessel not yet fully loaded and waiting for us to board. The sun shone bright and strong as we mustered on the upper deck with the majority of our fellow passengers, also keen to enjoy the warmth and the glint of the light on the waves. The Pocket Venus and I stripped off our jackets and gloves, unplugged our ears and flopped onto the railings to relax as we made the short cruise to our destination. As we sailed, I mused on the weekend to come. A seasoned camper, many is the bush behind which I have tucked my tent, many the forest canopy beneath which I have sought shelter; so the whole notion of ‘glamping’ had inspired a sort of bemused intrigue. In common with many other veterans of canvas, I feared that the presence of a bed and other such cushy amenities in my supposedly rudimentary shelter might somehow prove an offense to the principles of outdoor living; that said, it had taken little more than a glance at the website of the The Really Green Holiday Company to suggest to me that this glamping lark might actually prove more than satisfactory; and what’s more, I can pretend nothing but relief at riding a bike unencumbered by a tent, sleeping bag and related accoutrements. 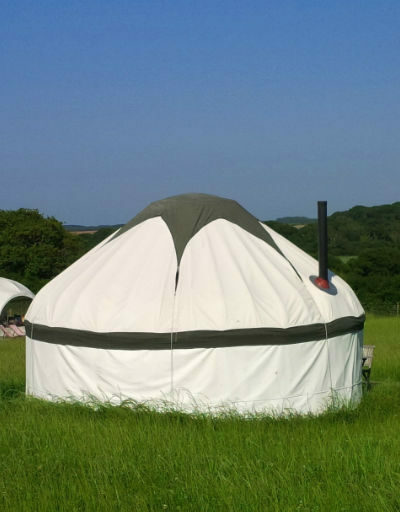 Anthony, the jovial owner of the Really Green Holiday Company, had given great assistance on the telephone and his directions upon arrival in Yarmouth were as easy as pie to follow, so within 10 minutes we were rumbling along a country lane on the approach to his small colony of yurts. 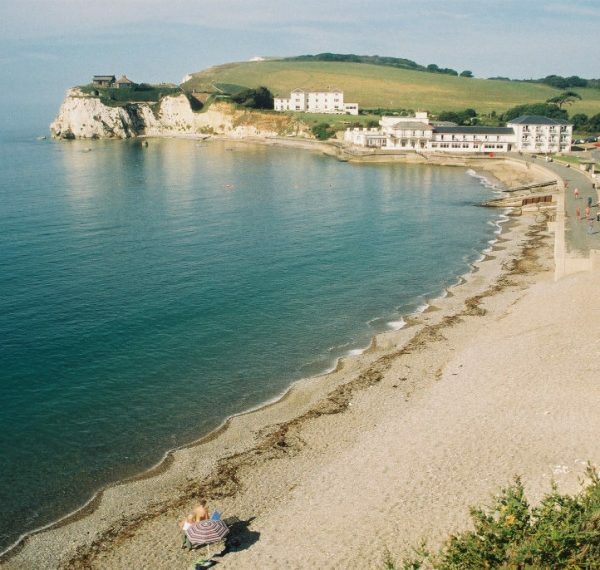 Anthony was there to greet us and was everything I had imagined from his warm manner on the phone: cheerful and welcoming, he seemed like a man who had determinedly created a rural idyll for himself – and others – and is thoroughly enjoying it. He told us that he had started the Really Green Holiday Company back in 2008 with Alison Martin. The original site was based at Afton Apple Farm but outgrew the land and they moved to King’s Manor in 2013. The new site has six yurts in it as well as an open-sided communal tent where guests can cook, eat, socialize, sit and read, or idly swap tips on local cider and the best secluded beauty spots. The field has beautiful views down to the River Yar and in the adjoining field were two donkeys. This pleased the Pocket Venus no end, reminding her of her childhood companions, and we duly treated Cappuccino and Cliff to a bag of carrots (and she would cut my brake lines if I didn’t name-check them here). 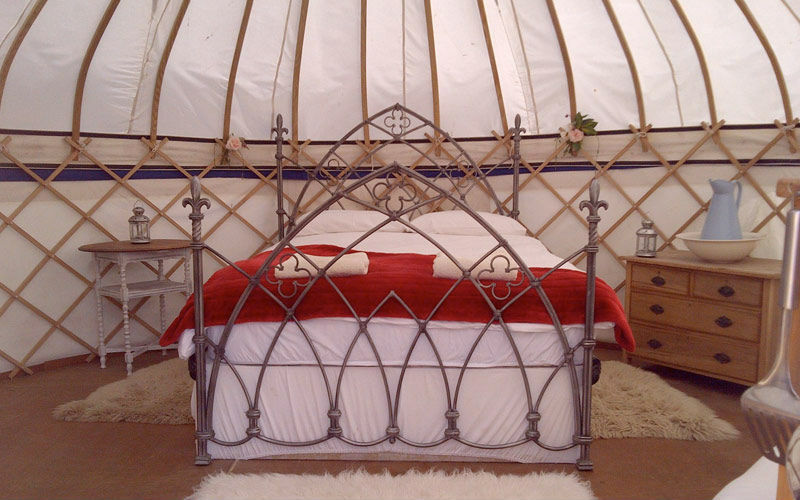 The inside of the yurt was like a little cottage, with a double bed, small chests of drawers and the wood-burning stove. Our yurt was equipped with everything we needed, which was handy as all we had packed was a top-box of personal essentials. The kitchen and the shower block were just a short walk away across the grassy meadow in which the yurts are based, and bed linen and towels were provided for us on request. All the facilities were charmingly rudimentary and yet eco-ingenious. 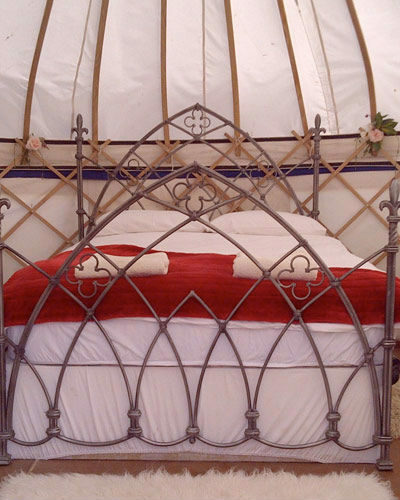 I lit a small fire in the yurt’s stove (as much for the delight of pyrocreation as for need of any additional warmth), and was soon tucked up in the paradoxical comfort of an iron-framed thick-mattressed bed-in-a-tent. The local King’s Manor farm shop served a wonderful fry-up which we enjoyed sitting outside in glorious sunshine. We bought extra sausages from them, and after a great day throwing the bike around the glorious roads that criss-cross the island, occasionally stopping to catch our breath in a secluded cove, we fired up the barbecue right outside our yurt and popped on the wonderful sausages whilst enjoying a local cider. Sausages sandwiches were eaten in the dwindling light and soon the stars came out to tell us it was time to retire to the comforting nest of our yurt. We were entirely charmed by the Isle of Wight, its twisties, coves and yurts; and could well imagine making the trip a regular one. 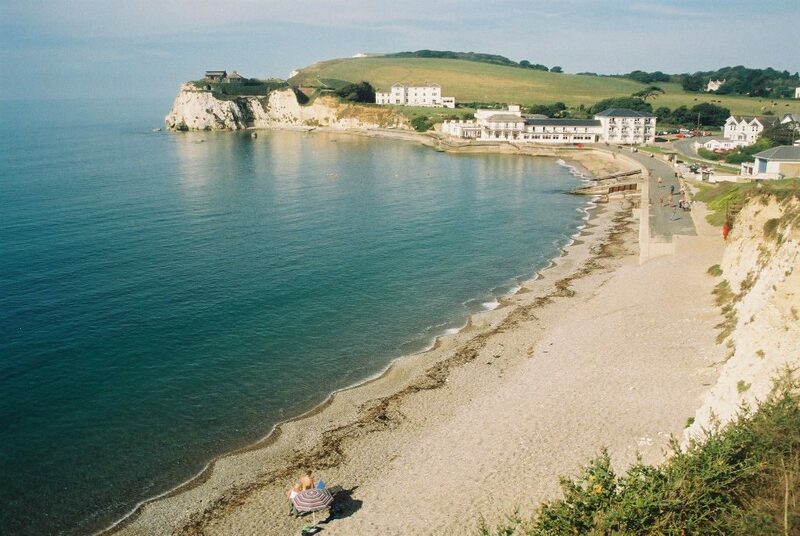 Glamping makes for an ideal biking holiday… and The Really Green Holiday Company are the ideal people to glamp with!